A friend brought a rather impressive card-built village to the Gulf Roleplaying Community’s stand at the Middle East Film & Comic Con in April. 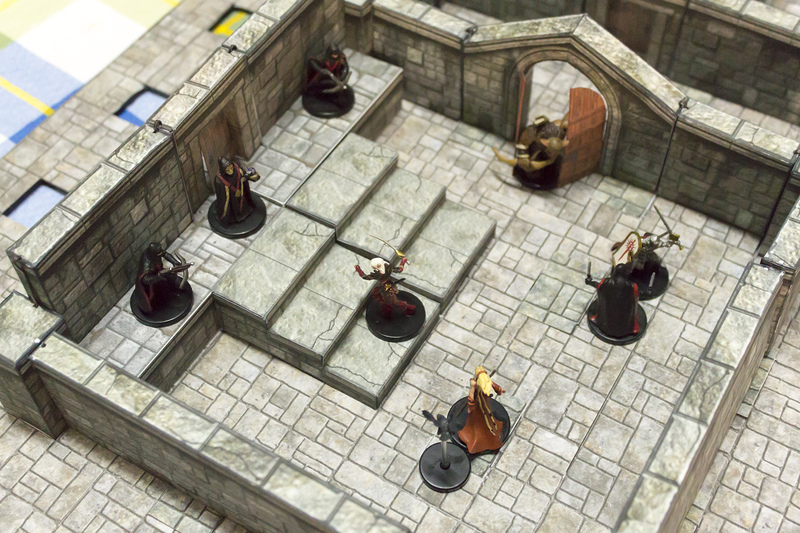 Googling it later, I discovered Fat Dragon Games’ line of 3D, cardstock buildings, interiors and dungeons. I’ve had the idea of building a 3D dungeon in the back of my mind for a while. Try telling non-gaming friends you’re planning to build a dungeon at home – the reactions range from puzzlement to horror to a sudden creepy interest. The idea behind these is that you buy a PDF and print at home. The PDF’s are pretty cheap (the core dungeon set, E-Z Dungeons Deluxe, is $12). Of course, you also bear the cost of cardstock and ink (and glue, craft knives and, most significantly, time to build). The advantage is that you can print as many of an individual item as you need. A nice touch is that each PDF is layered. You can choose to add water stains, cobwebs and blood spatters to the dungeon walls. The ones I’ve printed have the water stains layer activated. Printouts are clearly marked with score lines and cut lines. There are even guides for automatic cutters, if you have one of those (I don’t). There’s a pretty good set of instructions included, with advice on optimal printing, preparing the items to cutting (scoring the card before bending is important), and the right types of glues to use (paper glue with the lowest moisture content you can find – UHU is great) and how to assemble the items. Members of Fat Dragon’s forums will also provide helpful advice on request – the papercrafting community seems small but very friendly. As with any craft there’s something of a learning curve. Some items, such as walls, are fairly simple to build – they’re basically just boxes. Pillars aren’t hard to build, but involve some fairly complex cutting. Archways are a little more complex, and there are some items (such as the dungeon idol), that I’d rather not tackle until my skills improve – partly because I don’t need them right away. Not that the skills needed are especially complex. You quickly learn which cuts and scores are important, how much glue to use and so on. Complex items come with their own instructions. The main thing that increasing experience builds is speed. 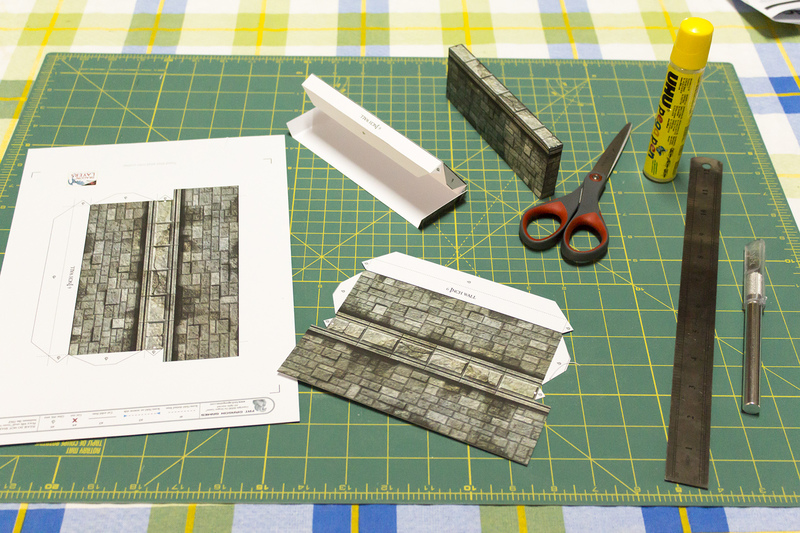 A six-inch wall in various stages of construction – printout, cut and scored, test folded and finished. There is some necessary equipment before you start building. A good craft knife, steel straight edge and glue are essential. A cutting board and a pair or sharp scissors are also extremely useful. Cardstock is, of course, necessary, and foamcore is useful for making sturdy bases. There are a couple of ways to approach construction. The default approach is to permanently build key elements of a dungeon (corridors, corners, rooms, etc), then fasten the foamcore bases together with cocktail sticks (aka toothpicks). Free floating elements such as walls that tie the permanent structures together are fastened with hair grips (aka bobby pins). I elected to go for the second approach: build a foamcore base with holes cut in for over-length ‘E-Z lock’ columns to plug into. These provide an anchor to which you can attach walls and other items as needed, and unused holes are hidden by card ‘caps’. It seemed more versatile and easier to store the individual elements. I planned to build the dungeon a few rooms at a time, rebuilding it when the PCs moved to a new area. However, though storage is indeed easy, it takes far longer than I expected to build the dungeon; when I’ve used it it’s been for big set-piece encounters, as my original plan of building and rebuilding would hold the game up too long. I wonder if the original method is not the best after all. Making the foamcore base proved something of a chore. 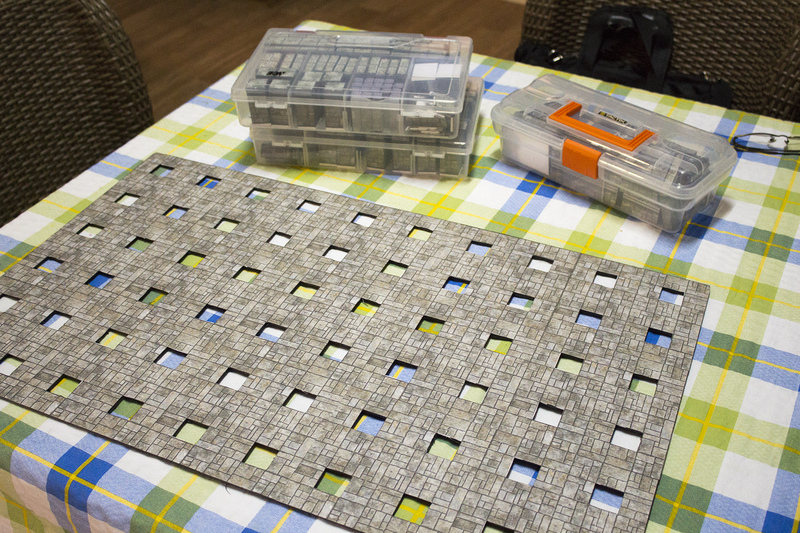 One of the Fat Dragon forum members recommended printing the floor tiles on full-page labels (such as shipping labels), and sticking those on the foamcore base. This worked like a charm, and avoided me having to mess around with spray adhesive. However, cutting 60 one-inch square holes in the base was a chore, even with a heavy duty X-ACTO knife. The next issue was simply making enough walls and other elements. The first time I tried to assemble a few rooms I realised I was way short on walls – and with the game the following day, I spent all night making more. These issues, however, are mine. I’m extremely impressed with the PDF set. It’s clear a lot of time and effort has gone into designing them, and the results are extremely attractive – and for a very affordable price. 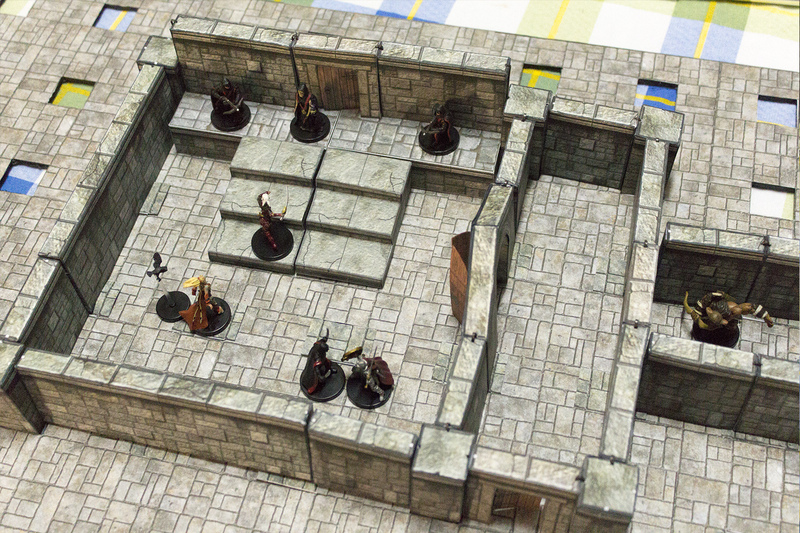 Building a papercraft dungeon certainly isn’t for everyone. In the two weeks it took moe to make mine, I’ve gone though frustration and pleasure, but for me it’s been worth it. And it isn’t over – I want another base board and a lot more elements (the PDFs include everything from ‘construction’ elements such as archways and stairs, to barrels, crates, tables, traps and treasure chests. Expansions include sarcophagi, various traps, a torture chamber (with paper guillotine, rack and iron maiden among other devices), sewers and more. It’s going to be a long time before I consider this project finished. But, hey, I can just print out what I want to work on at any given time and I’m away. Unexpected reinforcements arrive as the PCs battle cultists. After that, of course, there’s a village, the castle, the caves, the forest campsite, the science-fiction base, the modern city street… Fat Dragon have built up quite a catalogue. And I backed their wilderness terrain on Kickstarter. Five stars out of five. An excellent product offering a great deal for a very low cost. Highly recommended if you’re looking for a low-cost alternative to commercially manufactured 3D terrain and you’re prepared to put the time in. Excellent and very useful review for someone (me) who’s totally new to this product and would love to get into something like this. As someone experienced with all the basic items you list (foam core, card stock, hobby knife, scissors, etc. ), I’m very excited. Thanks! I look forward to sharing my newly created dungeon bits with my players!